TCP Westwood+: available in the Linux kernels 2.4 and 2.6. The experimental evaluation has been carried out by accessing the public Internet using a commercial HSDPA card (see figure below) and by employing the linux Kernel 2.6.24. TCP Bic/Cubic exhibit inflated values for average RTT due to the aggressive nature of their probing phase. TCP NewReno and TCP Westwood+ provide lower values of RTT, TCP Westwood+ exhibiting the lowest. 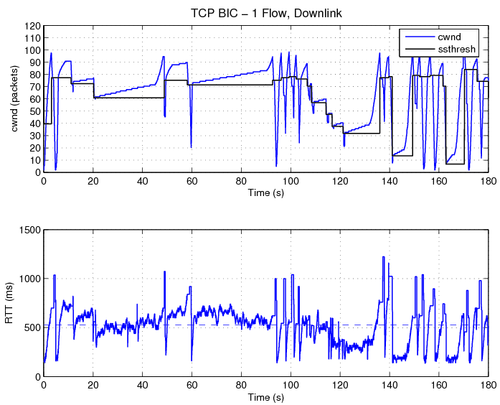 TCP Bic/Cubic provoke two times packet retransmission values with respect to TCP Westwood+ and TCP NewReno. 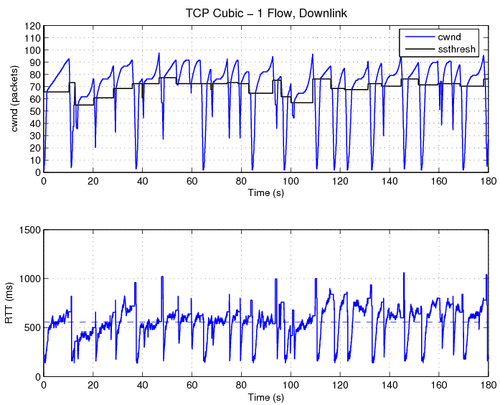 TCP Bic/Cubic provoke roughly three times the number of timeouts wrt TCP Westwood+ and TCP NewReno, TCP Cubic exhibiting the highest number. In the case of the uplink channel the algorithms exhibited similar performances, due to the fact that the moderate size of cwnd forced TCP Cubic and TCP Bic to use the linear probing in order to be TCP friendly (see ). Goodput-RTT plots for downlink and uplink channels. Reasons not to deploy TCP Bic/Cubic are rooted in its more aggressive probing phase. In particular, in common network conditions, TCP BIC/CUBIC exhibits: 1. a larger RTT average wrt to TCP NewReno or TCP Westwood+; 2. a larger number of retransmission wrt to TCP NewReno or TCP Westwood+; 3 larger throughput but same goodput wrt toTCP NewReno or Westwood+. In other terms, its more aggressive probing increases both throughput and retransmission but leaving unchanged the goodput that is neutral for the users but negative for the network.